We continue with more progress pictures of the 05Ric’s extended range bass (ERB) first looked at in Crimson Guitars’ ERB in Pictures – Part 1. In this segment, we’ll see the headstock and comfort contours evolve. 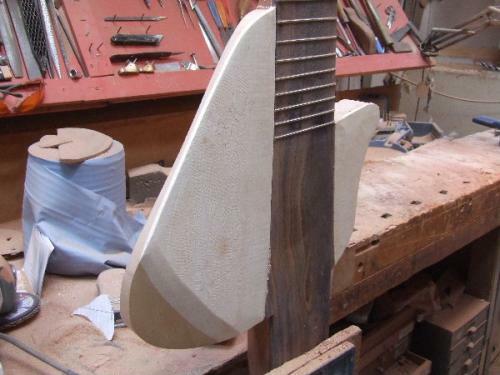 The bass guitar’s final appearance starts to reveal itself as comfort contours are added. In the next installment, we’ll see the final steps to the ERB’s completion. UPDATE 12.17.2007 For more, see Part 1 and Part 3 as well as the initial coverage of the ERB. 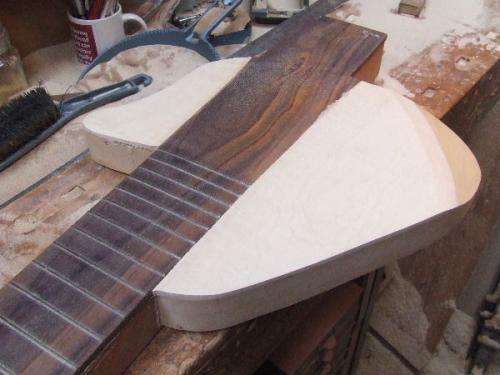 Thanks to Crimson Guitars for its generosity in sharing these (and many more) progress pictures. I have always been fascinated by how instrument builders do their thing. 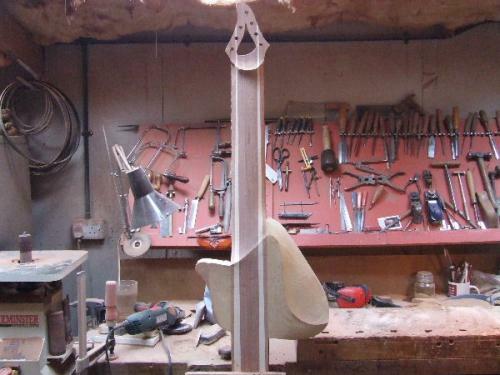 It is very interesting to watch progress pictures and also look at the finite guitar when it is ready. I’m glad you’ve enjoyed the article and welcome to the site.